This is the fun event you’ve probably never attended, but really should. As far as fundraisers go, this one places the emphasis on fun. The Foundation for Educational Excellence’s annual “Jewels and Jeans” event will take place on Saturday, March 4. Don’t miss this evening of denim, dancing, and dining, for a great cause, from 6 to 9:30 p.m., at the Country Club of Hilton Head. The fun-filled evening includes both a live and silent auction with incredible items, fabulous food, and amazing entertainment by local favorites, Deaz Guys, the band who plays all your favorite party songs. Get your tickets soon because this event usually sells out quickly. The denim aspect is a fun touch, as everyone gets to wear their favorite jeans and skip the formal wear! It’s a departure from the sometimes stuffier atmosphere of similar charity events, and makes for a great evening of merriment. So, why is it important to attend? The Foundation for Educational Excellence is providing educational advantages to Beaufort County students that no other group or organization does. It is a group of passionate, local volunteers, consisting of retired educators and business trailblazers, who are pioneering distinctive ways to support and provide a competitive advantage for students in Beaufort County. Begun in 2007, they support innovative educational activities and projects that surpass regular school lessons and budgets by providing grants and awards. Since 2009, proceeds from this event have allowed the Foundation to award over $140,000 in grants to the teachers and students in the Beaufort County public school system. Grants allow innovative teachers to take their students above and beyond what is covered in basic lesson plans by paying for materials that are not typically funded through traditional channels. These might include tools for teaching computer coding or robotics, all skills that are sought after in the workforce. 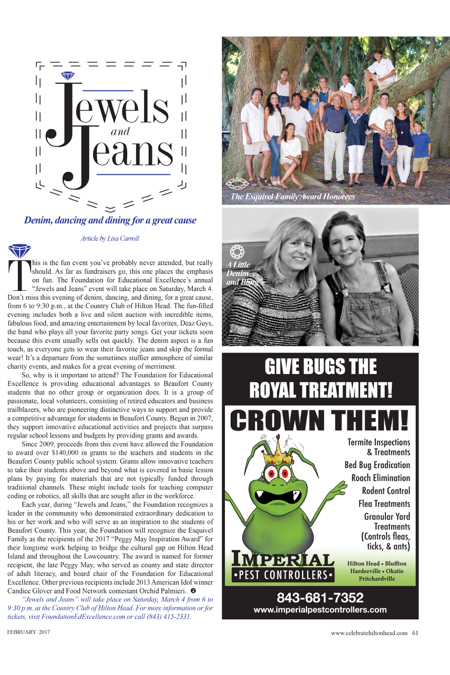 “Jewels and Jeans” will take place on Saturday, March 4 from 6 to 9:30 p.m. at the Country Club of Hilton Head. For more information or for tickets, visit FoundationEdExcellence.com or call (843) 415-2331.